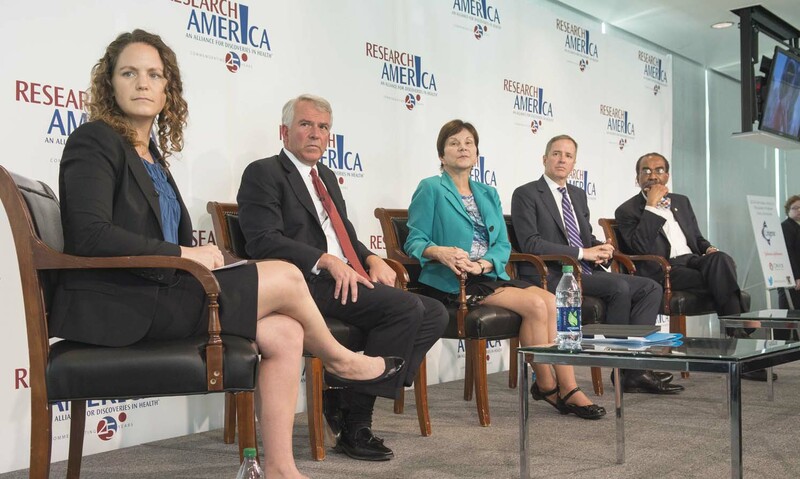 At Research!America's 2014 National Health Research Forum, attendees were provided an in-depth look at the issue of America's future as a world leader in research and development. The theme for this year's Forum, Straight Talk about the Future of Medical and Health Research, stems from Battelle's 2014 Research & Development Funding Forecast, which projects that China's investments in R&D will surpass that of the United States as soon as 2023.The program was held at the Newseum in Washington, D.C., on Thursday, Sept. 11,11:30 a.m. to 3:00 p.m. The Forum's three panels - sponsored by Celgene Corporation, Johnson & Johnson and Onyx Pharmaceuticals - each explored different facets of this complex topic, including the assumptions underlying the forecasted loss of R&D leadership, the public policy variables buffeting the research enterprise, and the actions needed within and outside the research ecosystem to out-pace expectations and optimize U.S. medical innovation. 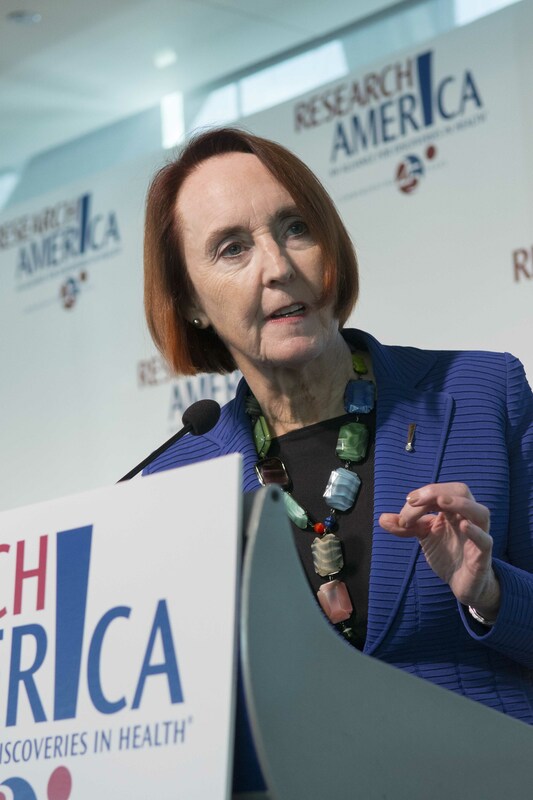 "The reality is that instead of nurturing it, we have put medical research and development on cruise control, in many respects, with the predictable result of an escalation in the pace at which other nations lure U.S. industry with more favorable tax and regulatory climates," said President and CEO of Research America Mary Woolley, as she opened the program. "And meanwhile, Congress remains deadlocked as their approval ratings tank." The first panel focused on the broad issue of "Where will U.S. Research and Development be in 2023?" Moderated by Corby Kummer, senior editor of The Atlantic magazine, this panel discussed what the future holds for federally funded and private sector R&D in the context of public policy trends, patient needs, workforce issues, new technologies,global health threats and public-private partnerships. Panelists included France Córdova,Ph.D., director, National Science Foundation; Anthony Fauci,M.D., director, National Institute of Infectious Diseases; William Hait,M.D., Ph.D., global head, Janssen Research & Development; Richard Myers,Ph.D., president, director, HudsonAlpha Institute for Biotechnology;and John Seffrin, Ph.D., CEO,American Cancer Society. "The National Science Foundation gives 94 percent of the money it gets, just over $7 billion, right back to researchers, mainly in our universities but also research institutes and even businesses," said Córdova. "We couldn't do that without Congress authorizing and appropriating those funds, so it's a virtuous cycle. We need to remind everyone where the money comes from and then get the message out about these discoveries, how they are made and why it's so important to continue in this pane." "Clearly that's where Research!America has made such an impact," continued Córdova. "Reminding all of us and the public that they need to get the message about who makes discoveries,namely the folks that we all fund, and how that money comes about." Hait, who has both an academic and industry background, added that the focus of attention has moved from basic research to the application and practical use of those discoveries. "I think that the pendulum has swung so far over that many, many NIH grants are judged by the applicability or the translational aspects," said Hait. "This really moves things away from the area we really need to get back to, and that's uncovering fundamentalknowledge." Fauci echoed Hait's point, that a change in the way America views science and research is essential and that change must come from the top. "I think we need a complete transformational change about how we look at science in this country,"said Fauci. "And it has to come from above. It has to come from administrations. It has to come from elected officials." Seffrin reminded attendees of the current health threats Americans are facing, and their potential impact. "What about the tsunami of non-communicable diseases that's coming overtly in this country and worldwide?" said Seffrin. "We have innovations at work and they're proven to work. We have to fund them and if we don't, shame on us. It's a clear and present danger if we don't beef up our investment in research." The second panel addressed the question "Can we end the assault on public health research and practice?" and was moderated by Lori Montenegro, national correspondent for Telemundo. Her fellow panelists included Tom Frieden,M.D., M.P.H., director, Centers for Disease Control and Prevention (CDC); Research!America board member Georges Benjamin,M.D., executive director, American Public Health Association; Lynn Goldman,M.D., M.S., M.P.H., dean, George Washington University Milken Institute School of Public Health; Jack Watters, M.D., vice president, external medical affairs, Pfizer Inc.; and Richard Kronick, Ph.D.,director, Agency for Healthcare Research and Quality (AHRQ). "Public health really is a best buy," said Frieden, regarding the importance and impact of funding research and development. "It's what protects all of us. It's what keeps us safe. It's what prevents problem from coming into this country and every dollar we invest is going to pay off." Frieden also emphasized the importance of individual patient stories in educating those who make funding decisions. "I think we need to have an approach, come at this from multiple angles," he said. "What we've seen is that some of the best partnerships and the most effective ways of informing people are working with the patients and families. So,getting individual patient stories out there makes a really big difference. And we need to be able to tell those stories well." Kronick called upon attendees to embrace their role in spreading the word on the importance of medical research. "We need the help of everyone in this room," he said. "Everybody knows there is tremendous amount of information all around and it is difficult to get attention to that information especially when we are not always able to identify individuals whose lives we've saved." Kronick admitted that more can be done to change perceptions about the value of research funded by AHRQ. "I and my colleagues have not done as good a job as we need to do in explaining the effects of the research and the evidence that we generate on improving the practice of care." The topic for the second panel had particular significance, as attempts have been renewed to end funding for the Agency for Healthcare Research and Quality (AHRQ) and social sciences research, among other cuts. At the same time, the Ebola outbreak has underscored the essential role the public health system and its public and private sector purveyors play in the U.S. and global safety and health. The third panel concluded the day's discussion with a look at "What's right - and wrong - with the research ecosystem?" Moderated by Margot Sanger-Katz, healthcare correspondent for The New York Times, The Upshot,panelists included Janet Woodcock, M.D.,director, Food and Drug Administration Center for Drug Evaluation and Research;Pablo Cagnoni, M.D.,president, Onyx Pharmaceuticals, Inc.; E. Albert Reece, M.D., Ph.D., MBA,dean, University of Maryland, School of Medicine; and Robert Hugin,CEO and chairman, Celgene Corporation. 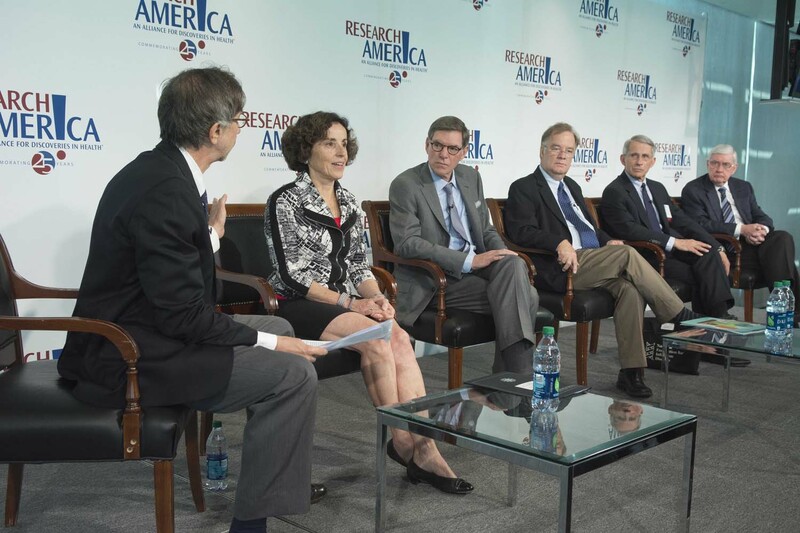 In this session, they explored key strengths of the U.S. medical research enterprise as well as current weaknesses. "We are on the verge of a therapeutic revolution due to discoveries in genomics, molecular biology and plain old biology," said Janet Woodcock. "And yet we have anemic translational and implementation arms to take all of these fruits of all of this research and all of this investment and actually translate it actionably into benefits for patients." 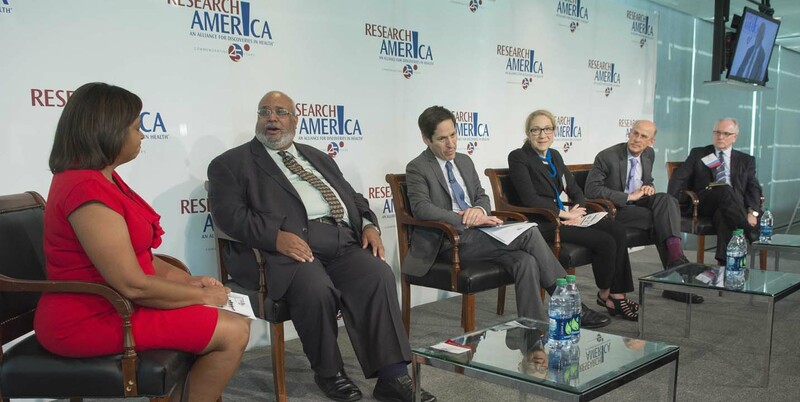 The panel concluded with a look towards the future, and posited changes that could improve the prospects for U.S. medical and health research by 2023 and maintain America's status as a world leader in R&D. "I do happen to think that a critical point here is innovation and drug discovery and development has to continue to be incentivized," emphasized Pablo Cagnoni. "And any discussion that leads to the wrong changes and change in that sort of incentive is going to be a bigproblem." "We have to be talking about how to reduce the costs of health care, make it more value-oriented," said Robert Hugin. "But this is not an acceptance that we need to reduce the amount of R&D. "And(regulatory) standards have to change ... otherwise we won't produce the solutions for the Alzheimer's, the cancer, the metabolic diseases, and we just won't make the investment," Hugin added. Research!America Board member Albert Reece also shared the importance of not approaching these issues in the same way. "We have sort of accepted our regulatory processes over the years and we have built on it," said Reece. "I do believe that it has served us well ... but at the same time, it's something that needs to be reviewed ... regarding how we can be helpful to the FDA to make certain the processes are more compatible with fast cures and fast processes." 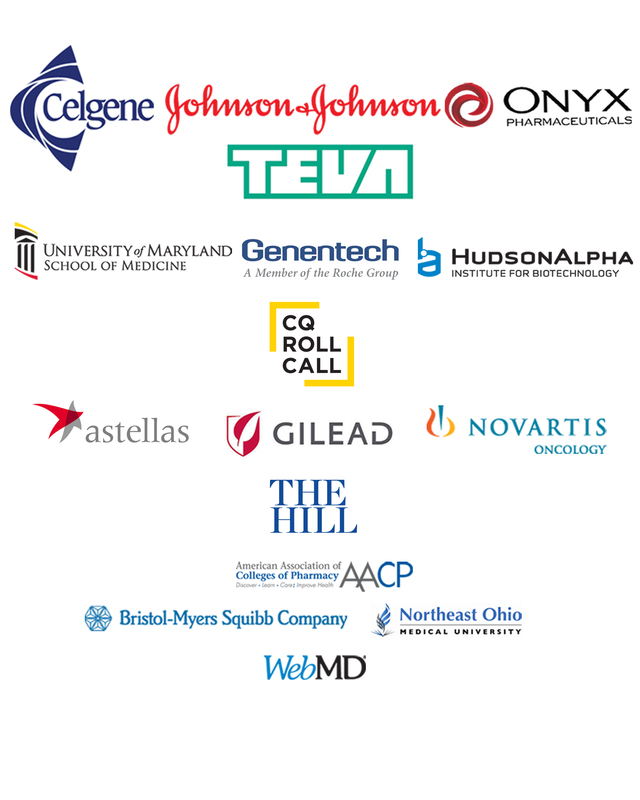 The Forum's topic, lunch and science sponsors were Teva Pharmaceutical Industries,University of Maryland, School of Medicine, HudsonAlpha Institute for Biotechnology and Genentech while the supporting sponsors for theevent included Gilead Pharmaceuticals, Astellas PharmaU.S., Inc., Novartis Oncology, American Association of Colleges of Pharmacy, Bristol-MyersSquibb Company and Northeast Ohio Medical University.